A group of 15 tinykittens are recovering after they were found stuffed into a suitcase that had been dumped at the side of the road. 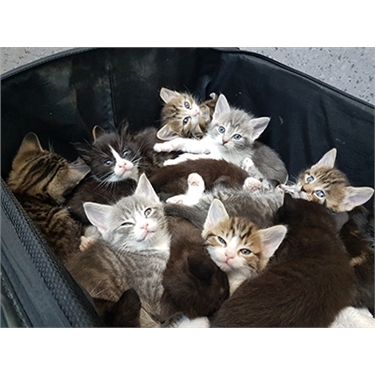 The baby cats – thought to be aged between three and five weeks old – were discovered by a veterinary nurse as she made her way to work on Saturday morning in Dagenham, Essex. Whoever dumped the youngsters had poked small air holes in the suitcase so that they could breathe. Welfare & Homing Officer Alison Gambles said: “Although they were all alive and in fairly good condition, they were clearly far too young to be away from their mothers. “Six of them had obvious cases of eye infection and although the others seem okay for now, we will need to closely monitor them. This story has been seen far and wide we have even had emails and donations from the US. If you would like to make a donation to help these kittens and others in our care then visit our donate page or you can now donate via text message. But one of the most important things to do is to get your cat neutered.